The final round of the 2018 season kicked off with Champions Carlton Heart facing a Balwyn side needing a miracle to avoid the direct relegation. Balwyn were caught in possession at the back early on and fell behind as Ali Al Sharani tackled his opponent with the ball ending up in the back of the net. Balwyn drew level through Behrad Behzadpour who has really hit the goal trail of late as he levelled proceedings which is how it remained going into the half time break locked at 1-1. Early in the second half Balwyn took the lead as they were fortunate with an own goal finding the net off Jackson Georgi to make it 2-1. Noor Khoshoba then found the net as he twisted and turned through the Carlton defence before finishing for a two goal advantage. A long range free kick from Iraj Hani was spilt in by Fodi Karatzas as Carlton were in real trouble trailing 4-1. Youngster Connor Irwin came off the bench and gave the Heart a spark as he netted to pull one back, But with time ticking down Carlton turned to the fifth man which only made things worse as Vincenzo Musico scored via a drop kick to seal the deal, before Behzadpour added the cherry on the cake with the Stars remaining a very slim chance to avoid relegation after an upset win. Second up saw Metropolitan who merely needed to avoid a thrashing of 11+ goals to earn a playoff, take on a Brunswick side looking to find some form going into the playoffs. The Silver Foxes opened the game as the stronger side with Hayden Kanjo scoring a toe poke from range to give his side the lead and make good on their fast start. Brunswick would pull one back through Andrea Zaccone to level proceedings, before Bakr Al Saudi got himself a goal to give the Bulls what was a deserved lead. Metropolitan pulled one back as Tomislav Grgic toe poked home on the counter attack to level the scores, before Khaled Ayache scored a goal of the season contender as he nutmegged his defender before cutting inside and picking out the top corner to give his side a 3-2 lead at half time. The game exploded into life in the second half as we witnessed nine goals in the final twenty-three minutes of play. Metropolitan adding five more to their tally as Khaled Ayache grabbed a second half brace to complete his hat trick, while Alija Redzepovic got two of his own and Hayden Kanjo completed a brace which was all enough for Metropolitan to grab the victory. Michele Salvi & Sergio Tapia grabbed second half doubles to make a real game of it, but it wasn’t enough as Metro hung on for the points as both sides go into the playoffs fighting for safety. Next up saw Fitzroy who had nothing to play for take on Pascoe Vale who needed the points to stand a chance of booking a Series Futsal Australia place. The Tigers would open the scoring as Jose Filho finished his one on one chance, before some good work from Scott Rogan saw his shot parried which Ben Monteleone followed in to tap home for a two-nil lead. Pascoe responded immediately as Joao Da Silva finished from close range to have his side within a goal at the half time break. After some initial resistance Fitzroy added to their tally with Tal Galper finding the net to extend the deficit. The game was all but over when Leo Kimpara rounded up Dianoosh Rasoulzadeh to all but sure up the points. Pascoe left nothing to chance as they threw on the fifth man, but conceded immediately as Jose Filho lobbed the ball into an empty net to add to the scoreline. A late ten meter penalty was awarded which Andre Caro stepped up and converted but it was only a late consolation as Fitzroy dash Pascoe Vale’s hopes of heading to Series Futsal Australia. The final game of the night, the final game of the season. 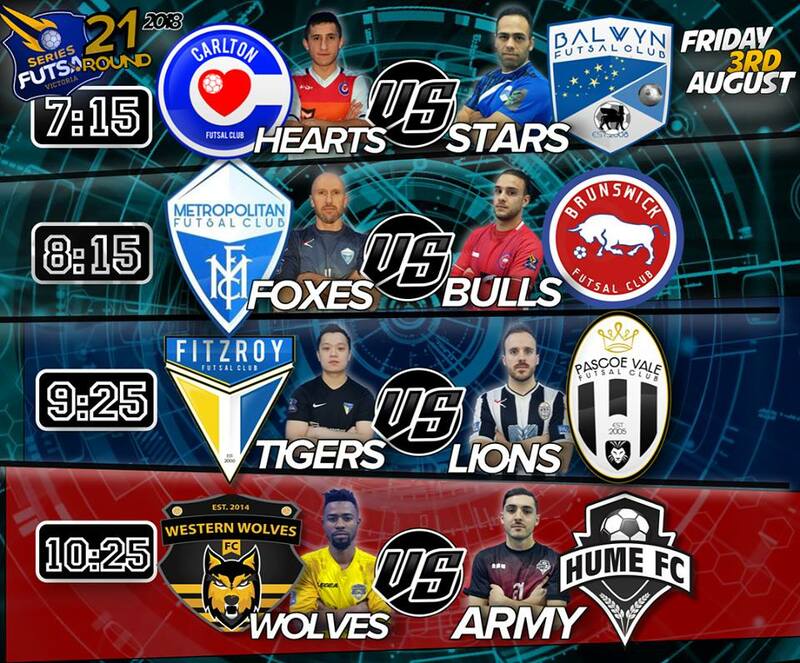 The equation was simple after Fitzroy defeated Pascoe Vale, A win for Western Wolves or Hume would see them qualify for Series Futsal Australia. After a nervy start to the game but it was Hume who drew first blood as Moe Matar beat his defender and slotted it home to give his side the lead. With the game in the balance, it would be Matar who stepped up again as he converted from close range giving Hume a 2-0 lead. at the half time break. Western Wolves came out of the half time break inspired and halved the deficit as Sofiane Soufi converted to bring them back into the game. Soon after the Wolves were level as Soufi lashed home another effort to restore parody. The Wolves then hit the front as the momentum was all in their favour as Elvis Kamsoba got his name on the scoresheet and the Wolves were howling. Kamsoba then got himself a second as he gave the Wolves some breathing space. Kamsoba then completed his hat trick and sent the crowd wild as they celebrated in style but in turn the celebration saw him receive a second yellow card and sent from the court. It didn’t matter though as the damage was done, Wolves qualify for their second Series Futsal Australia campaign leaving Hume heartbroken.